Many of the skills that are used in Buffy D6 are exactly the same as those used in West End Games' old Star Wars game, or the new DC Universe. However, I have made a few changes. The links below lead to each Attribute and explanations of the skills they control (many of the skills are more completely explained in the West End Games rulebooks). Attributes represent a character's physical and mental characteristics. Each Attribute controls a number of skills whose starting level depends on the current score of the Attribute. Difficulty: This gives an approximate Difficulty level to successfully use the skill. GM's should vary this depending on the situation: including stress, available tools, amount of time dedicated to the task, familiarity with the situation and other factors. Brawling covers basic hand-to-hand combat. It is less graceful than Martial Arts, but can be equally effective. A character will do an amount of damage equal to his Strength + 1D per Effect Value (10 over the Target Number). Note: Brawling may be taken under Strength of Dexterity. Time of Use: 1 action. Note that "big" jumps may require a certain amount of "hang time." GM's should consider this in modifying difficulties for other actions that are attempted while the character is in the air. Jumping is not really an "academic" skill, but it is a talent that may be cultured nonetheless. You may notice a somewhat strange progression in the distance covered and the number of successes. This is because almost anyone can jump at least a little, but only a few people can really jump far. A roll of 40 is about the maximum that an Olympic jumper could get (assuming he didn't use Wild Dice, Karma or Character Points--all of which, I think, are illegal at the Olympics)--this assumes a Strength of 4 + Jumping skill of 6 (World Class) and a getting an average of 4 or greater on each die. After 40, the distance increases dramatically. This is because the jumper will only get this far if aided by technology (cybernetics) or some other "superhuman" means (Karma or Character Points). I would recommend to GM's that a result of 40 be the "maximum" allowed any non-augmented jumper (this includes the use of Karma and CP's) because the laws of physics and gravity have to apply somewhere. There is simply no way for a "normal" human to jump 50 feet horizontally! 5 Horizontal: about 2.5 feet. 10 Horizontal: about 4 feet. 15 Horizontal: about 6 feet. 25 Horizontal: about 15 feet. 30 Horizontal: about 20 feet. 35 Horizontal: about 25 feet. 40 Horizontal: about 30 feet (this is about the current world record). 50 Horizontal: about 40 feet. Beyond 50, a jumper may only achieve these distances if aided by magic or technology. Even Karma and CP's should not be permitted to carry a jumper this far. 70 Horizontal: about 100 feet. 80 Horizontal: about 125 feet. For each additional 5, add about 25 feet to the result. Dodge is the art of getting out of the way. A character need only make one Dodge roll per round. The result becomes the base difficulty for anyone shooting or throwing anything at the character. Thus, if a character makes a Dodge roll resulting in 20, enemies will need at least a 20 to hit the character. The Dodge result replaces the base difficulty, thus a bad Dodge result can put the character in a worse position than if he had just stood still. Dodge may also be used to get out of the way of other objects that are not purposely aimed at the character, such as falling boulders, careening busses or out-of-control skateboarders. Specializations: Particular types of vehicles, such as Motorcycles, Sports cars, Limousines, etc. When choosing the Fire Weapons skill, the player must choose one of the categories listed above. The character is considered unskilled in all the other categories unless they too are selected. Martial Arts He's new. He doesn't know his strength. He-he might not know those fancy martial art skills they inevitably seem to pick up. --Dawn (about a vampire coming out of the ground). Time Taken: One round. Difficulty: Moderate (12) for standard blows (Damage = STR +1D per Effect Value); Special Moves have variable Difficulties. Martial Arts covers the study of unarmed hand-to-hand combat. At character creation, the character receives one special maneuver for each die they place in the skill. When the character advances with experience, each special move costs an additional 8 CP's (a character can buy as many as he would like). Example: Ishu has a Dexterity of 3D and at character creation adds an additional die into Martial Arts (giving her a total of 4D in Martial Arts). He chooses Disarm, Elbow Smash, Multiple Strikes, and Power Block. Later, she increases the Martial Arts skill from 4D to 5D (costing 12 CP's) and decides to purchase Spinning Kick for an additional 8 CP's. Hold/Grapple (VE + opposing STR): Once the target has been successfully held, the attacker must make an opposing Martial Arts versus the target's Martial Arts, Brawling, of Strength each round to continue to hold them. If the target is held, he or she cannot attack. Power Block (M): A successful Power Block stops an unarmed attack and inflicts STR -1D damage to the attacker (note: it does STR minus 1D dmg). Specializations: Particular weapon "classes": e.g., swords; wooden stakes; blunt weapons. Specializations: Particular archaic missile weapons: Bow, Crossbow, Slingshot, Dartgun, etc. Ride Horse includes all the knowledge one needs to train or ride a horse, perform simple animal husbandry, and prepare and maintain the appropriate tackle. This skill may be employed when one attempts to ride other animals (or, conceivably, certain kinds of demons). Running includes not only the ability to move your feet rapidly, but also of avoiding objects and stumbling while you are doing so. Running is often one of those essential skills for avoiding becoming dead (or deader, as the case may be...). Characters must make Endurance checks when they exert themselves physically and begin to push the limits of their energy. The GM may decide when rolls are appropriate. For example, if a character is chasing a thief through sewer tunnel, he will make a Running roll. If the chase continues for a long time, the GM will ask the character to make an Endurance roll. If he fails, he will have to stop running to catch his breath. The difficulty of the rolls should increase with the time of the physical exertion. Difficulty: As an opposed roll to the poison, drug or duress the character is attempting to resist. Difficulty: Highly variable, depending on what urge the character is trying to resist. Difficulty: Moderate (15), but may vary according to the "recipe" required. Alchemy is the "chemistry" of magic, used to prepare spell reagents, concoct potions, and, if you're really good, turn lead into gold. It is often a requirement for Ritualistic Magic. Difficulty: Easy (10) for relatively common mystical "facts" and items. Difficulty increases for more obscure tidbits. Arcana is a general knowledge and understanding of mystical rites, texts and traditions. It is used recognize mystical artifacts, prepare rituals, and recall arcane lore. It is a necessary skill for Ritualistic Magic. Specializations: Various bureaucratic organizations (Local city government, the US federal government, Demon groups, etc.). This character has an unfortunately advanced knowledge of how bureaucracies work. They will know who is in charge of what duties, where paperwork is kept, and what processes must be followed to get something done in a bureaucratic chain of command. Every species has its own kind on bureaucracy, and a smart individual can learn how to use it to his advantage. Difficulty: Easy (10). Increased for complex actions like Hacking (Difficult to Ex. Difficult) and breaking encryptions (depending on the strength of the cipher). Computers represents an overall ability to use and manipulate computers. The character not only knows how to access files, but can break through security, program, and do all sorts of other fun things. 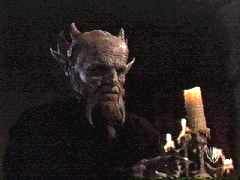 While this may not seem to realistic, in Buffy, a character with computer skills can pretty much do anything with a computer. Time of Use: 1 round to several hours or days, if research must be done.. GM's discretion. Difficulty: Easy (10) for "common" demons. Moderate (15) for most Grand Demons encountered demons. Difficult (20) for Arch Demons. GM's should modify for demons that are particular well known (in the D&D Monster Manual, for example) or very obscure (never encountered on Earth). Demonology is the study of demonkind: their history, ethnicities, abilities and weaknesses. With this skill, a character may attempt to gain insight into the motivations of a particular demon, learn how he was defeated in the past, or what types of behavior he might display. Handy skill on the Hellmouth. Time of Use: 1 round to several minutes or hours, depending on the actions attempted. In Buffy D6, Engineering is a catch-all skill that represents a character's mechanical aptitude. Generally, a character who is good at "fixing stuff' is good at fixing just about anything. This skill may be used to figure out a machine, fix it, break it, or design a new one. Difficulty: Easy (10). Difficulty may be increased if the information is obscure or from sources the character is unlikely to be in contact with. Gossip represents the character's knowledge of current social events--be they at school, in town, in Hollywood or, if the character is so connected, in the Underworld. At 1D, the character is pretty oblivious or gets most of her news from unreliable sources. At 2D, she has an average grasp of newsworthy events (notable break-ups, active feuds, etc.). At 3D, the person has a fair network for informants and files the information away in their head. At 4D, the character has a steady supply of information from a variety of sources, including some insiders. A character with this "skill" has regular (or at least semi-regular) employment and, thus, a steady income. The Job dice may be rolled to see if the character has enough spare cash to pay of certain items. The table below should give GM's some idea of how to set difficulties. Also, this "skill" cannot be used too often, of the player should endure penalties for "over-spending". Finally, the job requires some hours of devotion each week. Specializations: Anytime this skill is taken, a Specialization must be chosen as well. A character may specialize in any particular modern languages, or "Ancient" (see below). A character with a Language skill may choose any modern language to specialize in (this skill is always taken as a specialization), such as Spanish, French, Japanese, Hebrew, etc. The character may also opt to take the "Ancient" specialization. With that, the character may attempt to read (but not understand through speech), a very old, perhaps forgotten language from Earth's past (such as Egyptian hieroglyphics, Babylonian, etc.). The ability will also include knowledge of ancient Greek, Latin, and Arabic (and other languages used to write ancient magical texts). Difficulty: Easy for knowing basic information. Difficulty increases for understanding more complex legal regimes or employing legal knowledge in a professional manner (trying a case, etc.). With Law, a character understands how legal regimes work and what must be done in order to comply with those laws. Skilled characters may attempt to use the law to defend themselves (or others), gain access to information, or have the weight of authority brought done upon another person (i.e., charging them with a crime). Characters from other dimensions or cultures (human or demon) may be at significant penalties to understand modern American law. Specializations: Particular fields of study: Literature, Science, Occultism, Demonology, etc. Difficulty: Moderate (15). Difficulty increases for more rare and expensive texts. Library is not really a "skill" but a representation of how much energy the character has put into compiling useful books. When a character is seeking information on a particular topic, he will use his Research skill (see below). Then, he may roll Library to see if he has the appropriate text in his own library. Otherwise, he will have to go elsewhere to find it. Specializations: Particular areas: cardiology, optomology, etc. Difficulty: Depends on action attempted. 5 to render basic aid. 10 to perform advanced aid (patient is Mortally Wounded). 15 to perform light surgery. 20 for basic surgery. 25 for invasive surgery or to diagnosis a rare disorder. 30 for experimental or novel work. Special: Though Medicine is under Knowledge, when the skill is taken, it is at 1D (not the character's Knowledge skill). At 1D will be considered a medic or med student. At 2D, a registered Nurse or an intern. At 3D, a doctor. At 4D, a specialist or experienced doctor. At 5D and above, the doctor will have a good reputation in the field, perhaps even be world renowned. Medicine represents the whole of medical sciences, from advanced medic procedures, to surgery, to experimentation and development. When a character uses the Medicine skill to perform first aid and basic field/emergency procedures (including light surgery), it is added to the character's First Aid skill. Furthermore, it may be added to Physical Sciences rolls when performing biological experiments. Finally, it may be added to Research skills when doing a medical research in libraries or with a computer. Penalties may accrue when working in substandard conditions or with patients who are not human. Specializations: Particular fields of study: Physics, Chemistry, Mathematics, etc. Difficulty: Easy (10), but increased for more complex or obscure scientific theories. Physical Sciences represents knowledge in fields such as physics, mathematics, chemistry and biology. (Note: for ease of play, all these sciences have been lumped together. I know it's not very realistic, but in Buffy's world, brainy types are usually "good at science", not necessarily one specific type. Besides, it places a big burden on characters who want to be "good at science" to force them to learn different skills for each discipline). Time of Use: Several minutes to hours or days. Generally: 1D6 hours for each attempt. Difficulty: Easy for "common" problems (simple spells, lesser demons); Moderate for more obscure or complex issues; Increases in difficulty as the topic becomes more abstract, dangerous or rare. Research is the ability to use available resources--textual, electronic and human-based--to gather information on a particular topic. Sometimes this skill will only point the character to additional references ("The only known information on Asgorath is in the Black Codex of Bari, rumored to be in possession of William Fence...who happens to live in town..."). Time of Use: 1 round to several hours (GM's discretion). Difficulty: Moderate (15). Modify for available resources to scrounge in (dumps are better than jail cells). Specializations: Particular types of forces: SWAT forces, Demon horders, Scoobies, etc. Difficulty: Easy (10). GM's should freely modify this difficulty, depending on the obscurity of the item. A character with Investigation has honed her ability to pick up on clues, follow complex paper-trails, and put together disparate pieces of puzzles. This skill often comes in handy for routing out criminals, uncovering secret motivations behind business transactions, and discovering the truth behind long, lost secrets. It may often be used in conjunction with the Research skill, particularly for Arcane matters. Specializations: Particular games: Kitten Poker, Blackjack, etc. Gambling is quite common among mortals and demonkind alike. A skill gambler may make his living just about anywhere with a deck of cards or the roll of the dice. Difficulty: Moderate (15), modified by the table below. Difficulty: Easy for basic things (the color of a car, large items lying around); Moderate for more subtle clues (a small note pad, a door left ajar); Difficult and above for very small or hidden items (a scrap of paper tucked under a pillow, a fingerprint on a door jamb, etc.). Specializations: Type of habitat in which character seeks to be stealthy: Forest, Urban, Aquatic, etc. A character with Survival may attempt to endure the rigors of the natural world in a number of environments and situations. The skill is used when the character must find food and shelter or take other actions to survive in the wild. Note that Survival only covers what is needed for sustenance. If you want to build a nice house like they have on Gilligan's Island, you'd better learn Craftsmanship: Carpentry or something similar...Difficulty levels increase when the character is using Survival not only for himself but to aid others as well. Specializations: Tracking in particular habitats: Forest, Jungle, Urban, Subterranean, Desert, Arctic, etc. Difficulty: Easy (10) to Difficult (20) depending what is being tracked and where. Specializations: Bargaining over certain items: weapons, books, magic reagents, etc. Bargain represents the character's ability to haggle over just about anything. Without this skill, characters may find themselves much more than they should for goods and services. The table below gives general outcomes of Bargain "battles": If the winner is the buyer, reduce the "real price" (GM's discretion) by the Price Multiplier. If the winner is the seller, inflate the price accordingly. Specializations: Commanding certain types of troops: Soldier, Demon hordes, Scared Citizens, etc. Difficulty: Easy (10) to Moderate (15) depending on the situation. Can be easier or hardier depending on the skill and morale of the troops. With this skill, a character can manage, direct and mobilize others in a wide variety of endeavors. She knows how to give clear instructions and inspire obedience and prompt response. In the heat of battle, an able commander is essential. Difficulty: Opponents may make a Willpower or Knowledge opposing roll to rat out a Conning player. Specializations: Particular games: Roulette, Blackjack, Kitten-poker, etc. Gambling includes all games of chance, from poker to playing Monopoly for real money. Skilled gamblers can make a living finding local games and getting in on the action. Difficulty: Opposing roll vs. target (person being intimidated). Difficulty may be increased given the circumstances or disposition of the target. This character is skilled at scaring, bullying, and basically throwing his weight around. It is most often used to get people to do what one wants out of fear. Targets may provide information, goods, or services. Usually, however, the target will bear a grudge and use of this skill won't win the character many friends. Time of Use: 1 round. Can roll for one whole performance. Difficulty: Moderate (15). Vary difficulty depending on the quality and intricacy of the art attempted. With Perform, a character can attempt just about any art form. From song-and-dance to sculpture, the character can express herself and perhaps make a buck or two for the effort. Characters with high Perform skills will likely begin to gain notoriety, perhaps even become a celebrity. Difficulty: Easy (10). Targets may make Opposed Willpower rolls to set a Difficulty. Persuasion measures a character's ability to convince others of just about anything. It does not include the ability to bark orders (see Command), but rather to debate with logic, appeal to sympathy, and otherwise verbally convince others to see things the character's way.